For the last four years, we have been working with various City Council members to get the City’s “source code” online — we’re talking about the City’s charter, laws, rules, and daily record. The City’s administrative code is the City’s operating system. It governs how and when things can happen. For example, the City’s open data law is administrative code and not in the charter. In total, these changes require a charter revision committee or legislative action, and neither are easily done. Interlaced between these two is the City’s legislative portal, aka legistar. When a City Council Member wants to change the city’s laws, they work with the legislative drafting office and start crafting text that turns into a proposed legislation. For this legislation to pass, it needs three readings — introduction to Council, and a committee hearing. Through the committee process the Mayor’s office and public are able to provide testimony on how the bill should be amended or if it is a bad bill, be put aside. If it passes the committee hearing, it is sent back to the Council floor for a vote with or without modifications. Once the bill is back in the main chamber and a majority of council members vote for it, will it move on to the Mayor’s desk. Before the Mayor signs the bill and turns it into law, the Mayor hosts a hearing where you can provide testimony. Normally, people say thanks and then there is a bit photo opportunity. Historically, tracking these movements have been a pain. As a member of the public, you could pay a lobbyist to keep tabs on everything. Alternatively, a Council member could invite you into the process by emailing you updates. The third option popped up a few years ago. Long story short — Granicus, the City’s legislative software vendor, has always stated there was the option for a publicly accessible application programmable interface (API), yet the public never got access. Four years ago, Council member Kallos publicly challenged Granicus to provide the keys, yet the public was never given access. Two years ago, Participatory Politics Foundation (PPF) and DataMade refactored open-source software developed by Code for America and developed new robots to scrape every page on legistar. While un-ideal, we placed hope in robots till the Council could launch an API. Like Obi-wan used R2-D2, we used computers to carry our voice across the universe. OK, the internet. For now, the robots have been working to fill the gap. Through NYC Councilmatic, we have an API with data an open standard, we have email alerts, and we got an easy to use mobile responsive website. WIN! WIN! WIN! 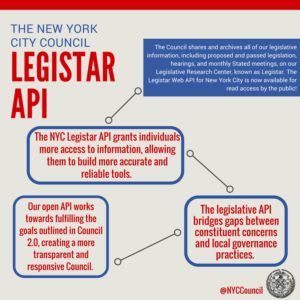 We are super excited to bookend the last four years of advocacy with the City’s legislative API joining the ranks of the Charter, the Administrative Code, the City’s Rules, and the City Record. For a democracy to exist in the 21st Century, we must have digital access to the underlying code. In this case, it is our city’s proposed legislative activity. Now, we encourage the Council to work with the Councilmatic team and configure the pipes to the City’s underlying legislative data. For more reading check out these two great articles from PPF. Many thanks to Speaker Mark-Viverito & her team. BetaNYC would like to thank Joyce Li for hearing out our ideas and shepherding them through the Council. Also, many thanks to Technology Committee Chair CM Vacca, CM Brad Lander, and Government Operations Committee Chair CM Ben Kallos.